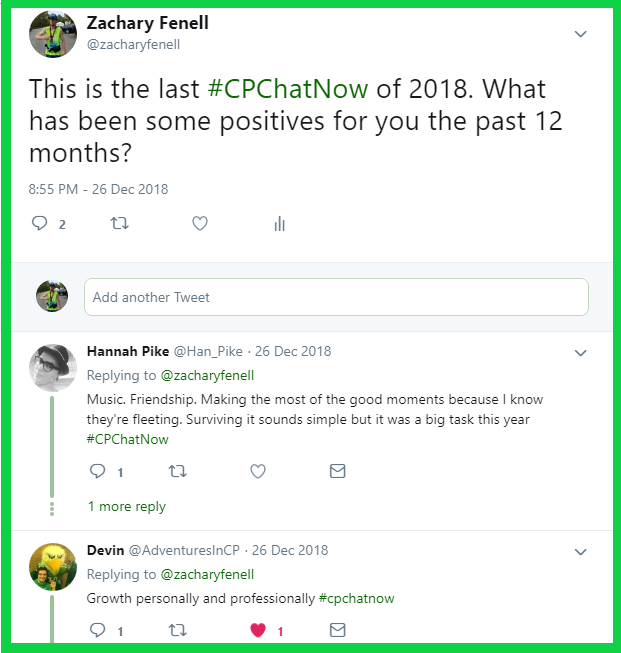 One night removed from Christmas, individuals in the cerebral palsy community gathered for the last 2018 #CPChatNow live Twitter chat. Holidays remained a forefront concentration too, as you will see reading this recap. A recap gifted to you by yours truly, co-host Zachary Fenell. Initial conversation revolved around Christmas gifts participants received the previous day. When asked about naming favorite gifts received, long-time chat regular Jen could not name just one. 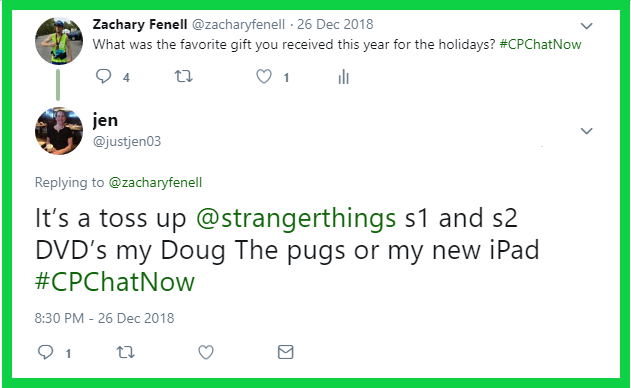 Between Stranger Things seasons one and two, her Doug the pugs, and new iPad Jen encountered a tough call. Meanwhile chat regular Seth and my co-host Devin Axtman expressed clear favorites. Seth’s aide gave him $100 on betonline, an online poker/sports betting site. Fun! 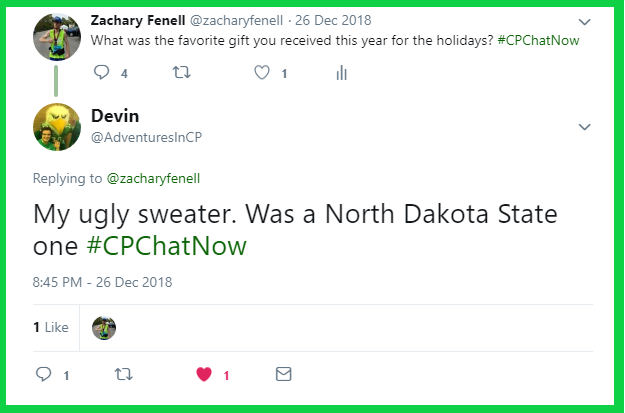 Devin also received a fun gift, an ugly North Dakota State Christmas sweater. Eventually the dialogue transitioned past Christmas to New Year’s. Personally, New Year’s always puts me in the mood to reflect. Therefore I asked participants to share some positives from their last 12 months. Another long-time regular Hannah recalled making the most of the good moments. Hannah experienced relentless health concerns throughout 2018, so enjoying the good occasions became extra important. Additionally, Devin responded saying 2018 brought him growth both personally and professionally. What about you? 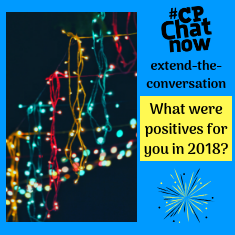 Answer for the week’s extend-the-conversation question, “What were positives for you in 2018?” Leave your reply in the “Comments” section. Expanding beyond our personal 2018s, we furthermore explored 2018 relating to the overall cerebral palsy community. 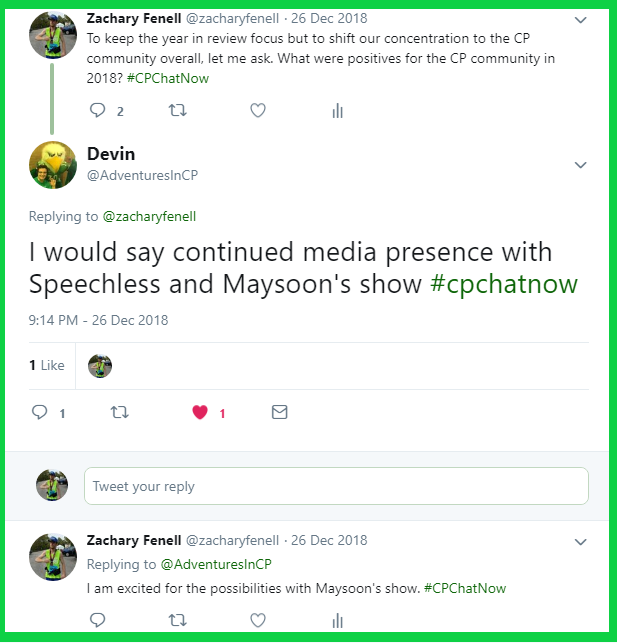 Answering the question “What were positives for the CP community in 2018?” Devin named the continued media presence with Speechless and Maysoon’s project. That latter project refers to Can-Can, a sitcom starring actor, comedian, and past #CPChatNow participant Maysoon Zayid. In late 2018 ABC ordered a Can-Can pilot. Can-Can possesses exciting possibilities. Same applies to Speechless perchance the show gets picked up again in 2019. 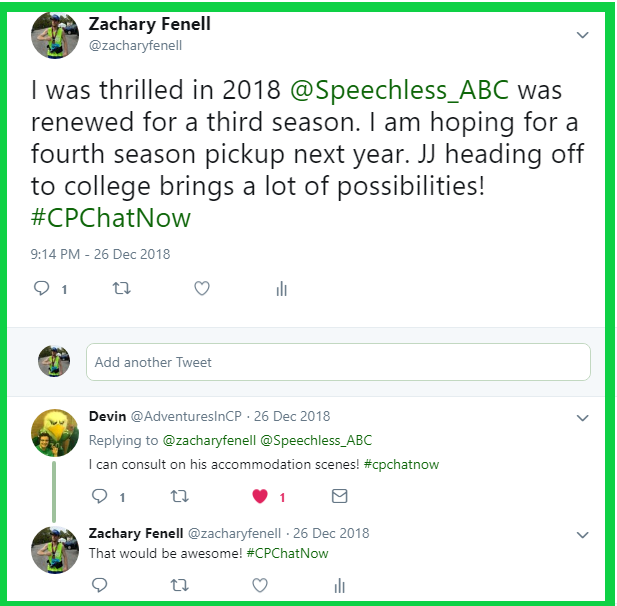 Speechless getting renewed for season three stood out to me as a 2018 positive for the CP community. Now I am hoping a fourth season will get the green light in 2019. Much potential exists story wise regarding JJ heading off to college. Devin noted he could even consult on JJ’s accommodations scenes! My co-host’s work history gives him the credentials. You never know, right? Respond below! Then make a New Year resolution to join us on Twitter every Wednesday at 8pm ET. 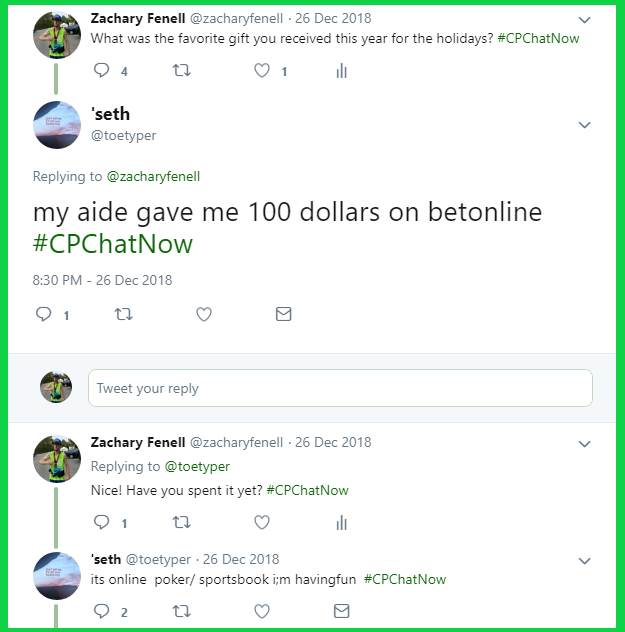 The week before Christmas was an eventful week as always in #CPChatNow. Members talked about returning to their former clinic, the character of Tiny Tim, their grandparents, and more. This is #CPChatNow Co-Host, Devin Axtman, taking you along on this week’s recap. This brings us to our extend-the-conversation question: What do you wish others knew about your strengths while living with CP?